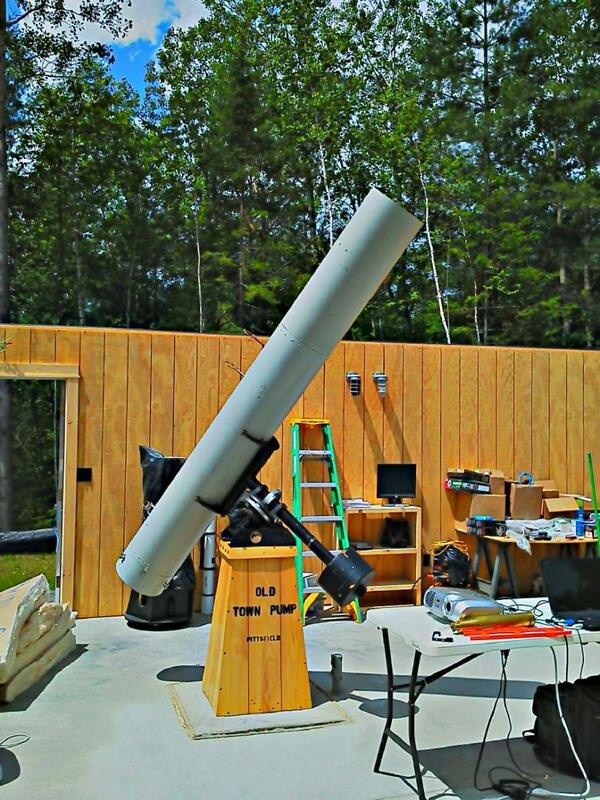 One of the signature scopes at the Adirondack Sky Center & Observatory is the The "Old Town Pump" Telescope. 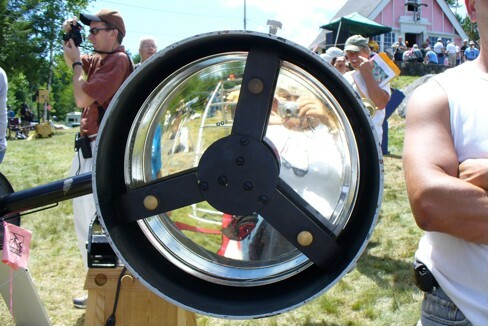 The telescope was built in Pittsfield, Massachusetts by A.W. (Wally) Everest in the 1920s. The name of the telescope derived from a bit of personal humor. Everest thought the balancing arm had the angle and proportions of the Old Town Pumps you can still find preserved in public spaces in villages and towns throughout New England and the Northeast. Old Town Pump Telescope, 1928: Set up on Breezy Hill, Stellafane for the first time. Wally Everest was an engineer for General Electric, an inventor, a ham radio operator, and a friend of famed amateur telescope maker Russell Porter. In his adult years, Wally Everest ground over 100 mirrors, for friends and for his own telescopes. In addition, he also taught classes about astronomy and the art of telescope making (images of hand-drawn glass slides Everest used for these lectures can be found on this page). His continuous experimentation and refinements came to the notice of Russell Porter and Albert Ingalls, the Editor of Amateur Telescope Making (ATM). They considered Everest "the premier amateur mirror maker of his day." Ingalls included an article on mirror making by Wally Everest in the first edition of ATM published in 1927. 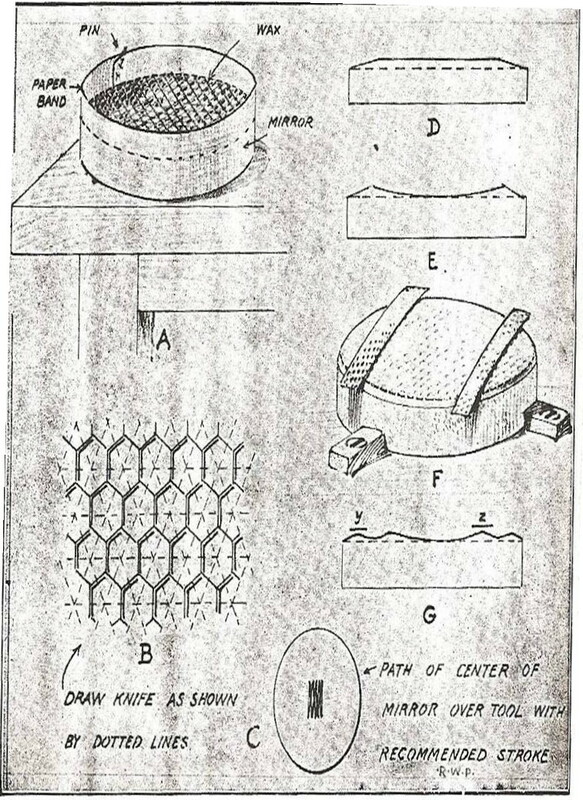 The article was illustrated with photographs and technical sketches. 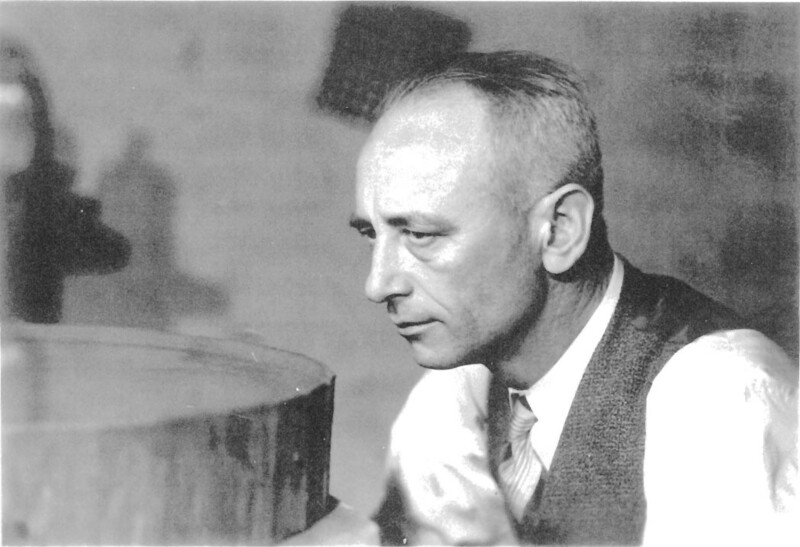 Image A: In the late 1930's, Everest obtained a 21½" mirror, one of six that had been cast along with the final 200" mirror used at the Palomar Observatory. Most of these small mirrors were used by Corning Glass as test pieces. The mirror was ground to f/4.5, and is at its final polishing stage. None of the other test mirrors are known to exist. 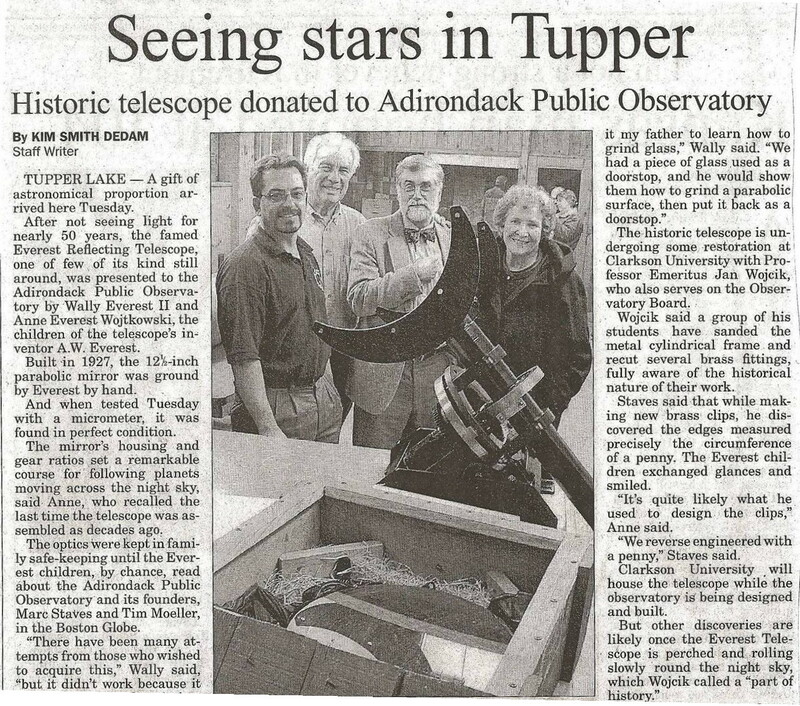 An educational display of the 21½" mirror is planned for the facilities of the Adirondack Sky Center & Observatory. 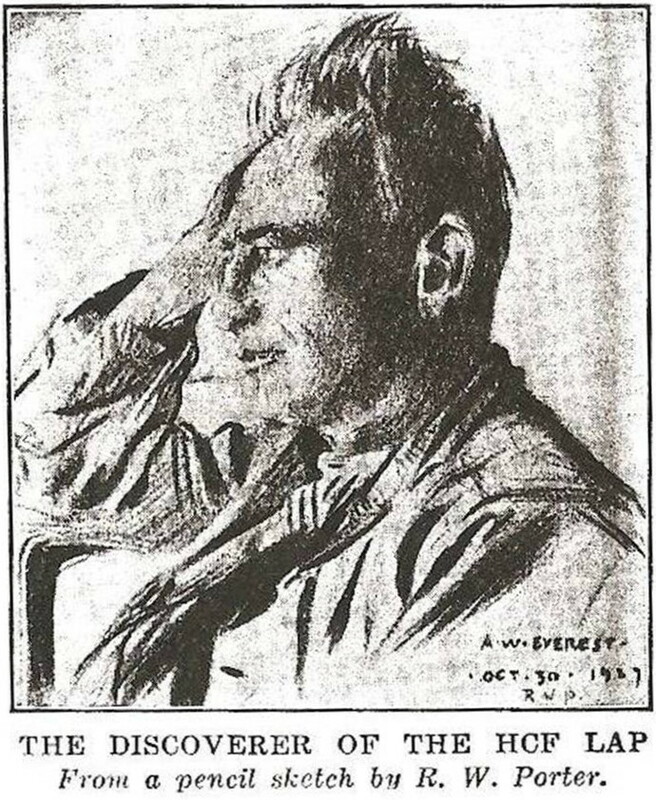 Image B: Portrait of Wally Everest in pencil by Russell Porter. The pencil sketch appeared in the first edition of ATM (1927) and is one of several of Everest drawings by Porter. A collection of Porter's sketches, which include other early luminaries of amateur telescope making and charter members of the Springfield Telescope Makers, hang today in the Club House at Stellafane. A photo of Porter, Everest and other amateur telescope makers can also be found there. Image C: Technical drawing by W. Everest. as appeared in the 1927 edition of ATM. Wally Everest designed and built the Old Town Pump telescope for his personal use. It remained in his garage for many decades, from there to be dragged into his driveway to offer splendid views of the heavens to his family, friends, and himself. It was his favorite astronomical instrument. He brought it to an early Stellafane Convention in the late 1920s and set it up on Breezy Hill. There is no record of whether it won any competitions. After Everest's death in 1962, his family wanted his telescope to remain available for many people and many observations. 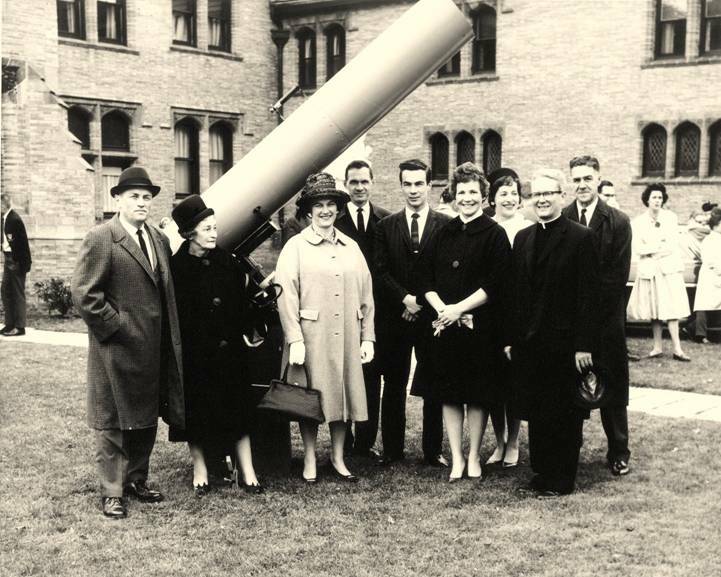 In 1963, the donation was made to a private school which promised to build an observatory for it. Several years later, the Everest family discovered that the telescope had been neglected and damaged, even vandalized, and several components such as the wooden base and the hand made brass refractor finder scope had been stolen. 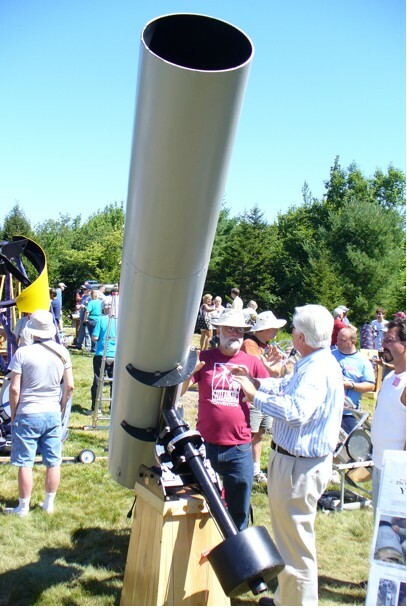 They retrieved what remained of the telescope and stored its components in the basement of his son and namesake A.E. (Wallie) Everest, Jr., where it remained for more than 40 years. "We received inquiries about it occasionally," Wallie Everest Jr. said, "from other schools, some universities and even the Smithsonian. We were flattered by the interest, of course. But none of the offers seemed right. We certainly did not want the telescope to become a museum piece in a display case. We wanted it restored and put to use again." Walley Everest's family at the dedication ceremony 1963. 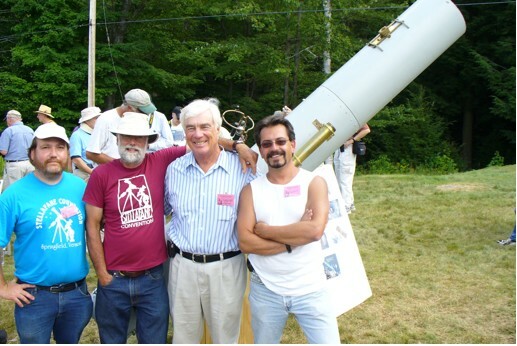 Early in 2006, Wallie Everest read an Associated Press article in the Boston Globe about a group of amateur astronomers and telescope makers in the Adirondack Mountains in New York State. They were planning and raising money for The Adirondack Public Observatory. 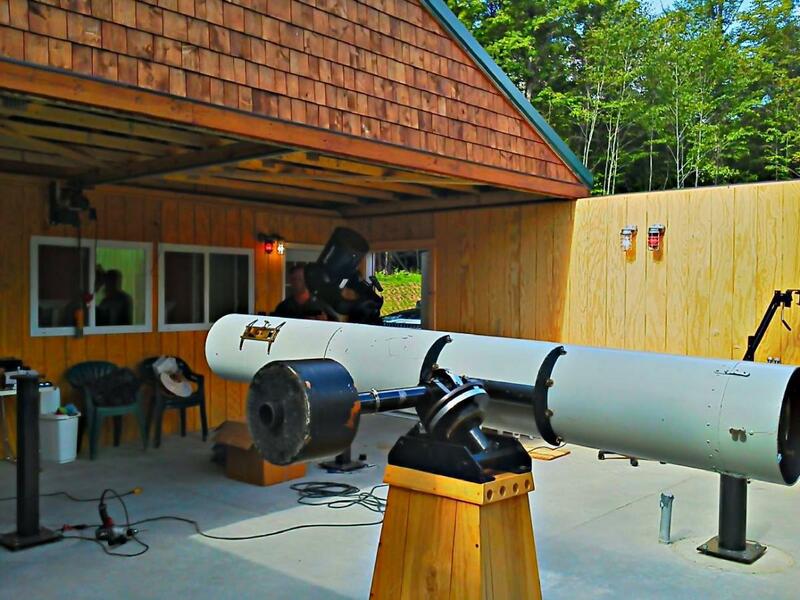 Several integrated buildings would house research grade and educational telescopes for professional and public use, along with a planetarium, classroom, and museum featuring antique astronomical instruments, all on a dark site on a hill they had purchased outside the Village of Tupper Lake in the middle of the Adirondack Park. Members of the APO were delighted when Wallie Everest inquired about their interest in restoring his father's venerable telescope. 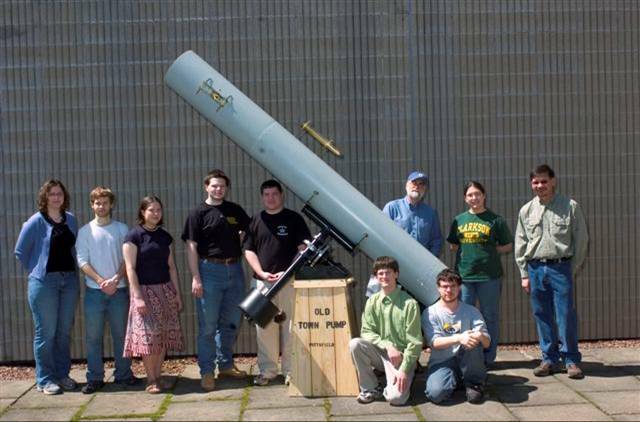 The Old Town Pump Telescope moved from Wallie Everest's garage in Marblehead Massachusetts to a workshop in the Physics Lab at Clarkson University, in Potsdam, New York in October of 2006. The restoration began with many sound components. The mirror was beautiful. APO president Marc Staves and his friend George Viscome tested its optics. 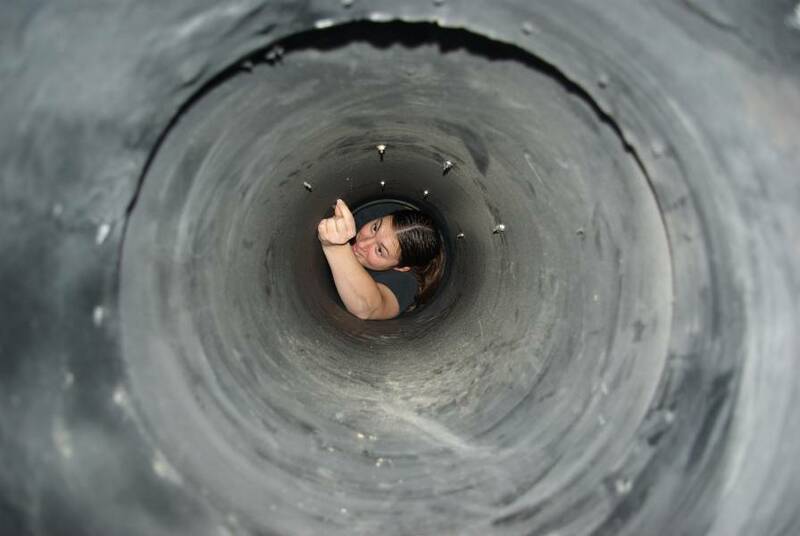 The three sections of the masonite tube still fit together, although a large hole had been punched in one. The hole disappeared under fiberglass, sanding and paint. Wallie Everest Jr. had been delighted to discover when he examined the parts that the small electrical motor in the drive began to whir when he plugged it in. A label on the motor identified it as the works of an electric kitchen clock famous in the 1920's. A Clarkson electrical engineering student brought the wiring up to code. The drive mount and gears needed cleaning and repainting and lubricating but then meshed effortlessly. Marc Staves, president of the APO laughed when he found, while examining the drive parts, that they were from an old Chevrolet differential like one he had worked on as a kid. The Clarkson students were mostly engineering majors. They were fascinated by the cleverness of the old-fashioned technology, and marveled when the weight of the tube bearing on the drive caused just enough friction between the plates for them to revolve in unison – although a small amount of twisting allowed an easy disengagement for star alignments. One student said "I wouldn't even want to think about how to design something like this on a computer." The focuser was a revelation. It moved the eyepiece and attached prism up and down the focal length of the tube. Someone had replaced the original brass eyepiece holder with a plastic piece. Good machining and lots of polishing made it look good as new. The original wooden base and brass finder scope were missing. 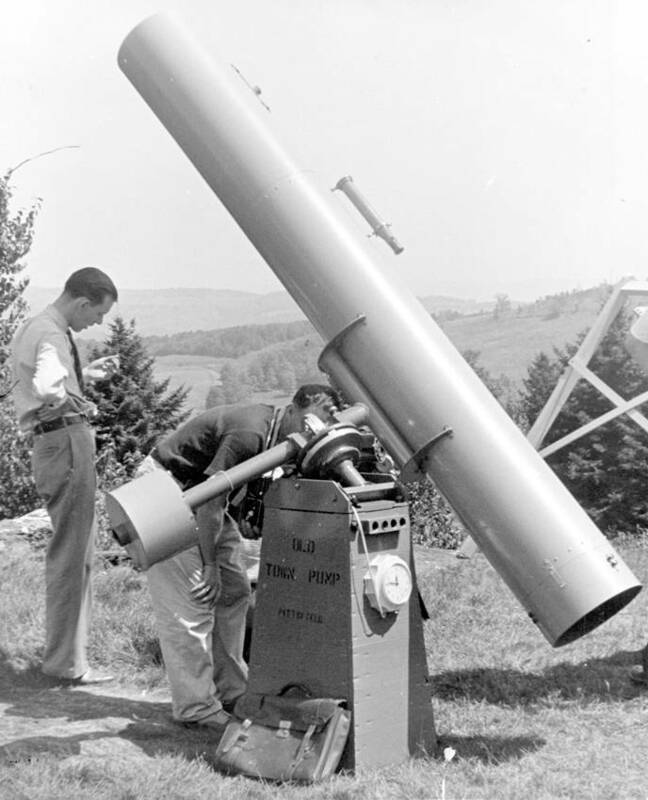 Using the photograph of the telescope set up on Breezy Hill in the 1920s, the students where able to scale the missing parts against those that remained. Several built a replica of the wooden base using lumber from the woodlot of a member of the APO. Wallie Everest was pleased when he heard about this innovation in the restoration. He said his father grew up in New York State, and would have especially liked this touch. Restoring the finder scope was the hardest task. Nothing commercially available that looked like the original could be found. An appropriately sized brass tube was ordered from McMaster-Carr. Someone found a heavy brass plug in the Physics Lab storeroom. A skilled machinist milled it into a tapered eyepiece holder. The telescope had come with a wooden boxed set of brass eyepieces, one of which was requisitioned for the finder scope. And serendipitously, in a box of odd parts Wally Everest had left behind, the restorers found a lens from a French camera of the early 20th century with the right focal length for the newly scaled and fabricated finder scope. While removing the bracket holding the counterweight arm to the middle section of the tube, the restorers needed to tear away the original semi-circular flanges through which the bracket could be bolted to the tube. One of the restorers examined what was left of one flange, reached into his pocket and pulled out a penny. As he suspected, the circular curve of the little flange matched that of the penny. The restorers, students and adults alike, decided Wally must have used a penny as a template himself. We would too in grinding replacements with a belt sander. One student said "it was like finding a fossil of an old engineer's clever way of thinking – right there in your pocket." To view a larger image and description click on the thumbnail. In the spring of 2007, just before final exams, the students and members of the APO finished the restoration. On the occasion of its "New Light" at Stellafane, an Astrovid Stellacam was attached to the Everest telescope and used to take the image at right of the asterism in Camelopardalis: "Kemble's Cascade" – itself named by an avid amateur astronomer – symbolizing for the restorers the cascade of history we have been able to join. 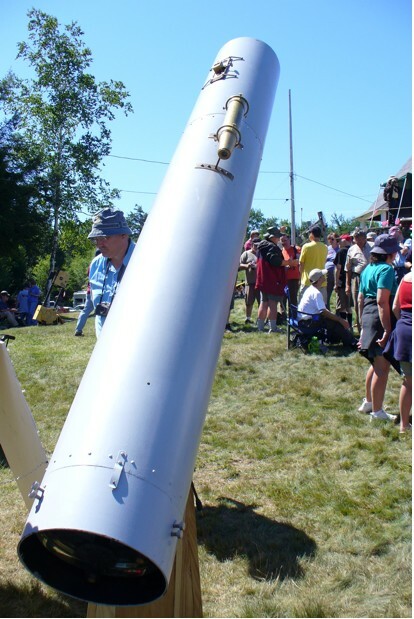 During the 2007 Stellafane Convention's Telescope Competition, the revitalized Old Town Pump telescope won 1st Prize for Excellence in Antique Restoration (see photos above). On November 27th, 2007, the Everest Telescope was formally dedicated at a ceremony at the Wild Center. The Old Town Pump finds its new home at the Roll Off Roof Observatory.